Welcome to Serenity Pools Online! What's Special About Serenity Pools? 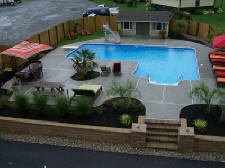 Serenity Pools was started in 2005 with a mission. That mission is to bring families together to build relationships with fun and fellowship in their back yard. 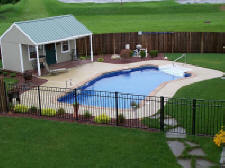 We do that by providing quality and hassle-free installation of your swimming pool. The desire to fulfill our mission means you receive unparalleled personal attention and care. Serenity Pools is special because we believe each pool installation is for a special purpose. Owner, Lamar Stoltzfus, has 14 years of professional experience in the pool industry to provide you with knowledge and competence from the moment he gives a free estimate to completion of the project. Lamar's personal interest in your pool installation ensures your happiness with the pool of your dreams. 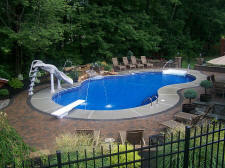 Understanding types of pools and the installation process can be daunting and stressful. Trust Lamar to make your new pool experience the exciting event it should be. We would like to thank all of our customers who entrusted Serenity Pools to build your pools in previous years. Your kindness in referring family, friends, neighbors and acquaintances has allowed our business to grow and tells us that we are fulfilling our mission. Whatever your reason for installing a quality in-ground pool, contact Serenity Pools and join our family of satisfied customers. Slides, diving boards, lights, and fountains make your pool more fun and versatile. Ask us about your options.